Opened by Dr Carole Wilson, Honours and Research Degrees Coordinator, Arts Academy, Faculty of Education & Arts, FedUni, at the Post Office Gallery on Thu 11 June 2015 @ 6pm. Cody Joy's understanding of drawing is a direct and sensitive method of revealing the artists' state of being - an immediate form of expression that reveals the process, moment to moment as it is made .... the act of drawing and its ever-changing moment to moment state of development, combining, recording and expressing different aspects of life experience. 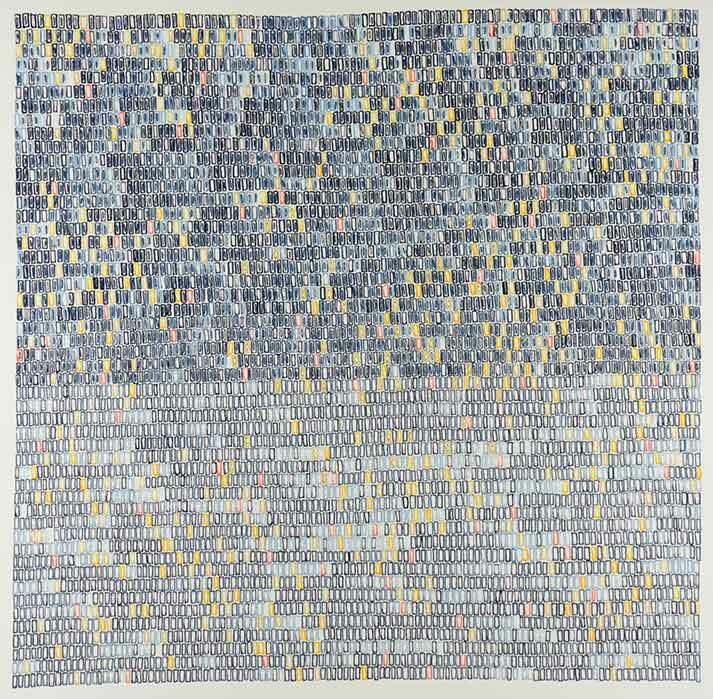 Joy's intricately stitched and drawn works explore the notion of a multilayered subjective reality and physical expression of human existence. Her drawing reflects her personal encounters and desire to record the complex relationships between herself and her world. For Joy, the re-examination and adaptation of the known and the unknown hold the most potential for exploration and development, both personally and artistically. Joy's work reveals traces of the lived and unlived experience, of places, real and imagined; of the meeting point found between the intuitive state of artistic development and the artistic process - celebrating the acceptance of self in its perfect state of imperfection. Her work can also be interpreted as a form of visual/conceptual blending, giving rise to discovery, change and adaptation. Joy challenges the uniformity of the mass-produced with handmade marks by leaving traces of her own hand - challenging the viewer at their most aware in the presence of what is hidden. Cody Joy's current exhibition and recent work constitutes the visual outcomes emerging from a practice-led research project for the award of Master of Arts at the Arts Academy, Faculty of Education and Arts, Federation University Australia. Image: Cody Joy Untitled (drawn out, pulled together), 2013 ink and thread on paper 56 x 56 cm.